The food I serve has to look colorful and inviting because eye appeal is almost as important as the aromas and flavors. Any extra effort and attention to detail can make the difference between serving a fast-food plate of food or one that is more like fine dining. The Tomato Flower Garnish has easy, step-by-step instructions and the result is a beautiful, colorful garnish sure to impress all who are served. Note: The tomatoes used were medium-sized, Campari tomato on the vine. 2. Using a very sharp, thin-bladed paring knife, slice off a thin layer from the stem end. This will allow the finished garnish to stand up. 3. 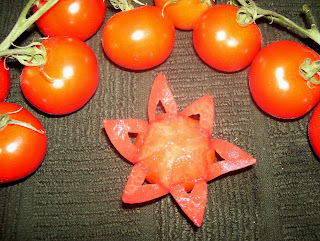 Stand the tomato. 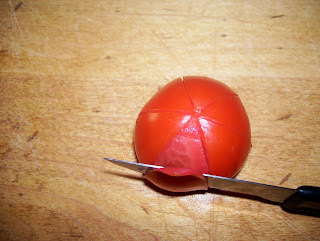 Starting at the top, score the tomato evenly into six sections. 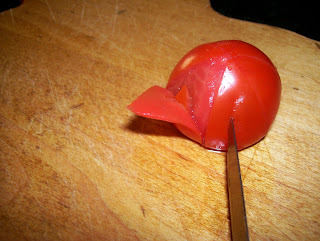 This scoring should only penetrate the tomato by 1/8 of an inch or so. 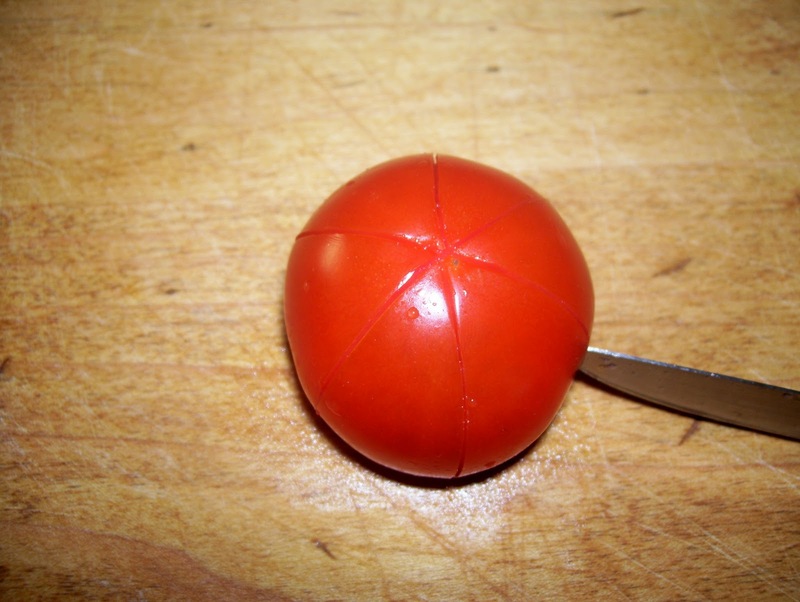 Each score line is cut 3/4 of the way down the side of the tomato. 4. With the tip of the knife, gently lift one of the points at the top of a wedge. Slide the knife under that lifted point close to the skin of that wedge. 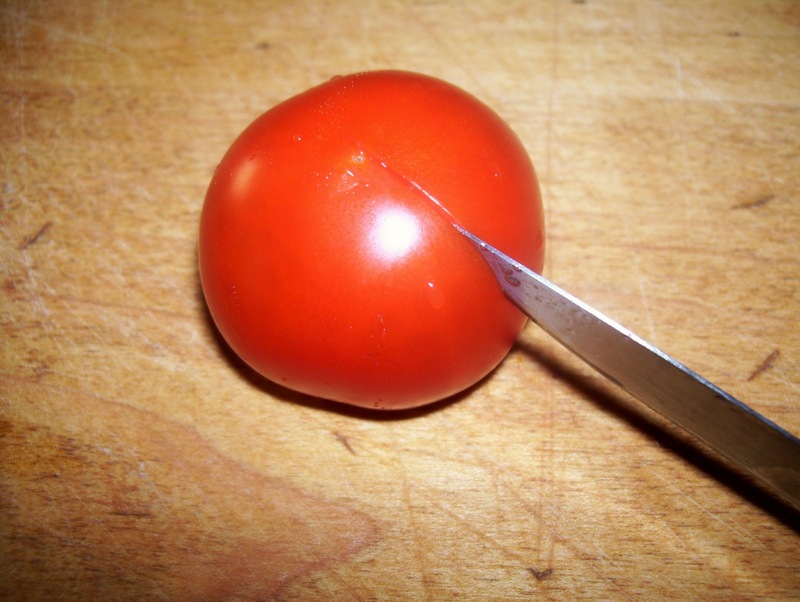 With a gentle sawing motion, slide the knife along until the skin has been sliced away from the pulp 3/4 of the way down the fruit. Do not cut off the skin. 5. Continue with the remaining 5 wedges. Gently press petals back in place, close to fruit for the next step. 6. 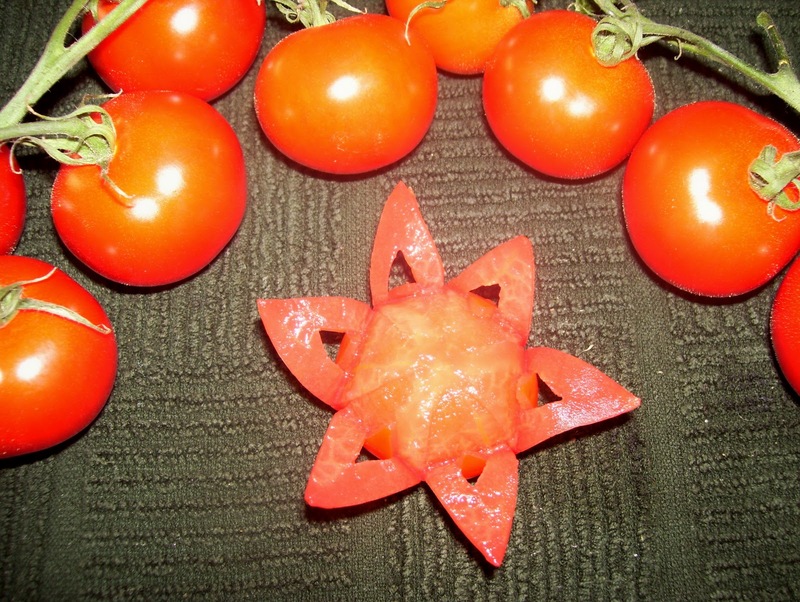 On the outside of each wedge, cut an inverted -v- shape into each of the 6 petals. The top of each -v- should be slightly above the middle of the petal. The cuts should be even in placement and size. 7. As the petal is pulled gently downward, carefully push the v-cutout inward with the tip of the knife so that the little skin section stays close to the fruit body. This creates the negative space. 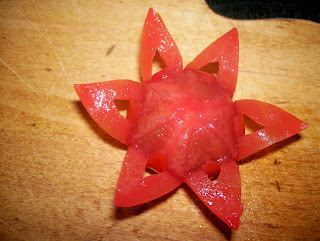 Marian wrote: The tomato flowers are beautiful! You are right about presentation. I have known eating establishments to fail just because their presentation was so unimaginative.